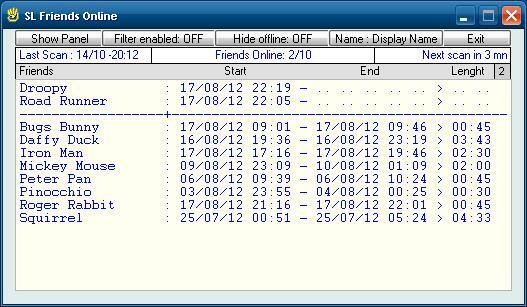 Want to know if your friends in Second Life are online, or was online when you were offline? 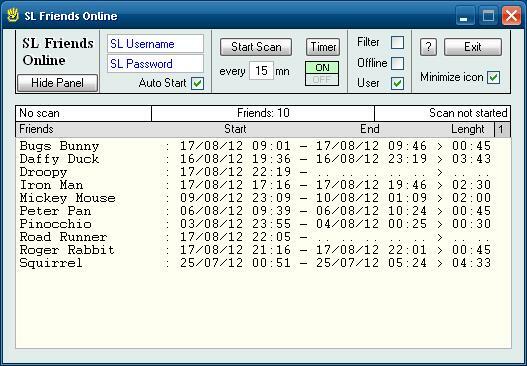 "SL Friends Online" scans your friends in Second Life, and displays the starting, stopping, and the connection time of their last 2 sessions. - Manage your Friend list by checking/unchecking Friend. - Show or hide offline friends. - Show compact window by hiding the panel. The program runs in windowed mode, or icon mode in notification area (bottom right corner next to the clock). * Enter your SL Username and SL Password. Then Click on <Start Scan> button. on list (online/offline) in alphabetic order. * Enter in text box, frequency of scan (default 15mn). You can check/uncheck the friends you want to scan, or delete them. * For informations, read "HELP.txt". "SL Friends Online" requires some environment files (MSINET.OCX, ...) may already be installed on your computer (depending on your version of Windows). If you're not sure, download the file "Light Setup version".